Lama Mark Webber will be giving teachings and instructions on the heart of Dharma practice: how to overcome afflictive emotions and thoughts through bodhicitta. It is our views, thoughts, concepts and afflictive emotional states that obscure our pure wisdom mind. This pure mind, called bodhicitta is the inseparable unity of infinite compassion and pristine wisdom. Lama Mark will be introducing us to deeply consider, reflect and meditate on distinguishing between this natural state of open mind — bodhicitta — and the waves of turbulence and attachments that ride on it. 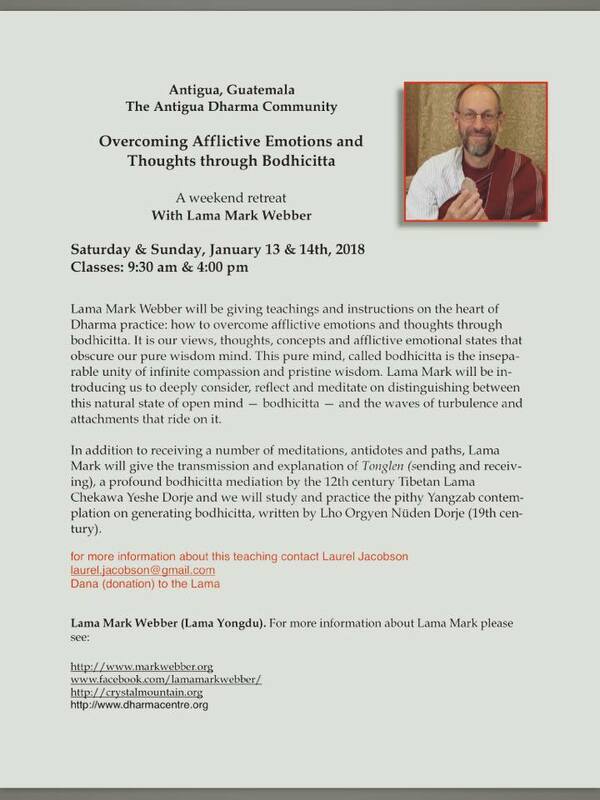 In addition to receiving a number of meditations, antidotes and paths, Lama Mark will give the transmission and explanation of Tonglen (sending and receiving), a profound bodhicitta mediation by the 12th century Tibetan Lama Chekawa Yeshe Dorje and we will study and practice the pithy Yangzab contem-plation on generating bodhicitta, written by Lho Orgyen Ntiden Dorje (19th cen-tury).